Well, that'll teach us to make assumptions... 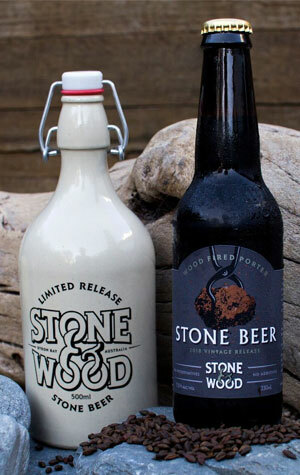 When writing about the 2017 Stone Beer release from Stone & Wood, we said: "Yet, after changing the recipe around regularly in the early years, it would seem they've got the desired outcome pretty much locked in these days." Clearly not, as this year there's a new look, a new beer, higher alcohol content and they've even given it a style descriptor: wood fired porter. That said, the process remains the same: invite a bunch of mates to Byron Bay, have a party, create a big fire, chuck in some volcanic rocks and, when they're hot enough, lower them into the beer before it hits the fermenters for a bit of added caramelisation. With a much changed recipe from 2017, the beer is a step or two away from its predecessors: darker in colour for one and, thanks to the use of cherrywood smoked malts (and, perhaps, the combined influence of the roasted barley), its smokiness is its most distinctive character, at least on the nose, veering close to peated, Islay territory. The smoky side is supported by a velvety mouthfeel and plenty of dark chocolate, coffee and a roasted bitterness in a beer that may be different to previous vintages but maintains the series' high standards. Fans of last year's version will be keen to hunt down the limited edition barrel aged version of the 2017 Stone Beer, which spent 12 months in ex-Port and second use whiskey barrels and is available in 500ml stone crocks. The beer retains much of the original's rich chocolate but has taken on added lusciousness and a sweetness that takes it towards brandy/fortified wine territory.